For a more balanced and detailed explanation of what footwear long-distance hikers wore on the AT this year and why, keep reading. If you don’t actually like nerdy pie charts, but you still want footwear advice, skip to the TL;DR at the bottom. We surveyed 152 hikers who had walked the AT this year: 57 section hikers and 95 thru-hikers. The age and gender of hikers in the sample were roughly representative of ATC’s thru-hiker data. Women were slightly over-represented (36.2%) compared to the ATC’s reports of approximately 25%. The majority of hikers were young adults or in their fifties. 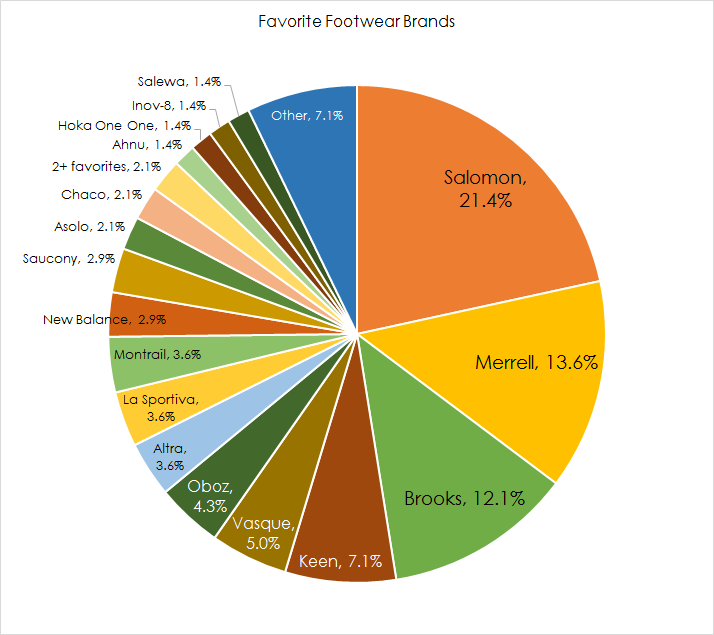 Although section and thru-hikers both spanned a wide age range, thru-hikers were, on average, significantly younger.1 We asked them about the shoes they wore, and here’s what we found. Most hikers will wear more than one pair of shoes during a long-distance hike. 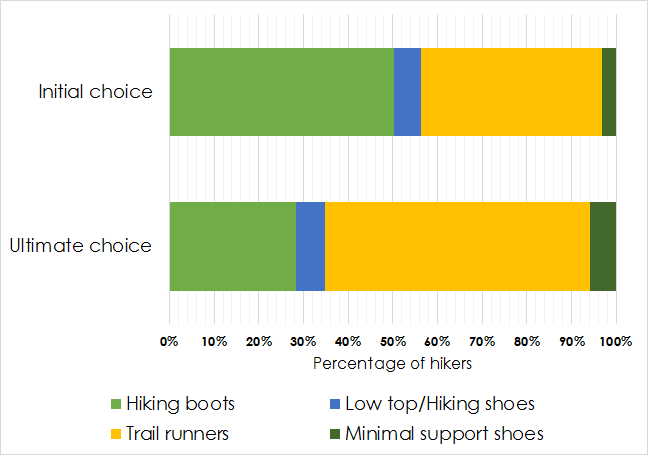 Unlike backpacks, which most 2015 hikers kept for the duration of their hikes, the majority of hikers in our survey switched their shoes out at some point. Most commonly, hikers switched to a different model of footwear. A quarter replaced their shoes at some point, but with the same model they started with. Only 1 in 10 hikers kept the same shoes the whole time. While 25% of hikers were unsatisfied with the shoes they started with, all but 3% of hikers who switched to a new model were satisfied with the shoes they ended up with. This suggests that hikers were not intentionally switching their shoes with the seasons; they were switching when their original shoes did not meet their needs. Which hikers are more likely to need replacements? Although this may seem obvious, I find it worth noting because trail runners and more minimalist shoes sometimes get a bad rap for being less durable than boots. Some hikers in our survey remarked that they personally thought trail runners need to be replaced more than hiking boots. However, we found this was not the case. Why did people switch types? Although distance hiked was associated with number of replacements hikers would make, it was not associated with switching the type of footwear hikers wore. Likewise, neither hiker gender nor backpack capacity was associated with switching footwear types. Backpack capacity roughly corresponds to how “ultralight” a hiker packed, so this means that lightweight shoes are NOT just for ultralight hikers. However, age and footwear support level were significantly associated with changing footwear types. Younger hikers were significantly more likely to switch types. It isn’t clear why, but my guess is that younger hikers had less experience, so they had less of a sense of what worked well for them before setting out on a longer trek. Likewise, hikers who started with more supportive footwear were more likely to switch types during their trek.3 This suggests that it may not be how far people hike that contributes to changing, but that many hikers do not find hiking boots as optimal for the AT as they expected them to be. Initially, 50% of hikers began with hiking boots, 40% with trail runners, 6% with low top hybrid boots or hiking shoes, and 3 % began with minimal support shoes (e.g., track running shoes, Chacos, Converse, Crocs). However, 59% of hikers ultimately ended up wearing trail runners, while only 28% ended up in hiking boots, 7% in low top boots/hiking shoes, and 6% in minimal support shoes (e.g., track running shoes, Chacos, Converse, Crocs). Based on my own experience, observations during my 2014 thru-hike, and comments from some hikers in this survey, I suspect this is because many of the problems with thick-soled, high-top, Goretex boots arise when they get wet. Especially when they get holes and THEN they get wet, such that the Goretex holds all the water in, rather than keeping it out. I am probably not the only one who avoids hiking during heavy rainfall when I’m just doing day hikes or short backpacking trips. Furthermore, I hadn’t worn gaping holes into my shoes until I walked a few hundred miles. For this reason, I hadn’t experienced the misery of waterlogged Goretex boots until my thru-hike, and simply didn’t expect hiking boots to be as bad of an option as they turned out to be for me. Beyond type of footwear, we asked hikers what brand and model they wore, and if they wore more than one, what their favorite was. The Brooks Cascadias (which also come in Men’s and Women’s models) had been the most popular series worn by the hikers we surveyed in 2014, worn by 16% of hikers. Although the Cascadias were still the most popular series in 2015, their popularity dropped to half of that this year, when only 8.6% of 2015 hikers preferred or exclusively wore Cascadias. This appears to be due to continued popularity of the Cascadia 8’s and 9’s, but dissatisfaction with the newest model, Cascadia 10. In fact, ALL five hikers in our sample who specified that they wore Cascadia 10’s (rather than 8’s or 9’s) said they were not as durable as the hikers expected them to be. Some words they used to describe them included “HORRIBLE,” “TERRIBLE,” and “DO NOT GET THE 10S.” Yes, all of them said those words in all caps. Four of these five hikers switched to Cascadia 9’s and found them satisfactory, so this issue appears specific to the 10’s.4 (I have no personal issue with Brooks and have never worn the 10’s; I invite readers who had a similar or different experience to comment below). We did not ask any questions about the use of additional insole inserts, but six hikers recommended these (I would personally recommend them as well). Three of these six specifically used Superfeet, and one mentioned that “Rob” at Outdoor ’76 in Franklin, NC will make custom insoles for hikers who stop at the store (I should probably disclaim my own loyalty to Outdoor ’76 because one of their employees gave me a ride from the trailhead, even when I flat-out told him I wasn’t planning to purchase any gear there). In the survey we conducted last year, we found that thru-hikers were more likely than section hikers to switch from hiking boots to trail runners. This year, due to more detailed questions and more advanced analysis, it appears that people wearing hiking boots, regardless of distance hiked, were more likely to switch types (specifically, to trail runners), as were younger people. Furthermore, thru-hikers were more likely to be younger, so this might be a reason behind the association we found last year. 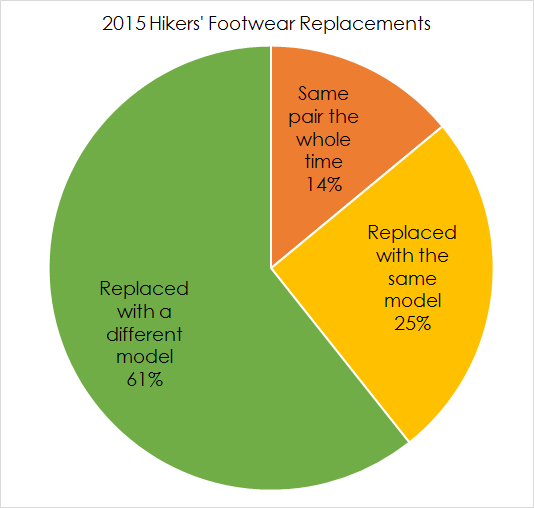 In 2015, we found that thru-hikers simply need to replace their shoes more times than hikers who don’t walk as far (which is sort of obvious), and while they’re replacing their shoes anyway, they may be switching types. Another notable difference was the unpopularity of Brooks Cascadia 10’s. While the Cascadia series (7-9) were by far the most popular model worn by AT long-distance hikers in 2014, and although the earlier models continued to be popular this year, the newest 10 model was the subject of poor reviews by long-distance hikers. Hiking boots were preferred by a strong minority (28%) of long-distance hikers in 2015, so you might be one of the people who finds them optimal for a long-distance hike. However, if you are unsure of the type you prefer, trail runners are ultimately more popular, even for people who thought they would prefer boots, so trail runners are likely the best option for a novice hiker who is uncertain what to choose. In this same vein, older (and perhaps more seasoned) hikers were more likely to stick to the footwear type they chose from the start, so if you fall in that category, you are probably good to go with the type you usually wear. Lightweight shoes aren’t just for ultralight hikers! Pack capacity was not associated with shoe type. Even sentimental hoarders (like me) prefer trail runners. The further you hike, the more shoes you will go through, and 9 out of 10 people who completed even a long (500-1000 mile) section had to replace their shoes at some point. Even if you already know you love the type and model of shoes you have, be prepared to replace them at least once. Be aware that some brands and even model series that have been popular in the past may have glitches in newer models that have not been around long enough for this information to be widely available. In particular, be aware that the hikers in our 2015 sample found the Cascadia 10’s were of lower quality than the previous models in that series. Once again, I forgot to include a question asking whether thru-hikers were northbound or southbound, which has pretty obvious weather-related reasons for potentially affecting gear choices. Oops. Prolly shoulda asked about insoles this time. We had an “other” box in which hikers marked “low top boot,” “hybrid boot,” “hiking shoe,” etc. so that I was able to include that category. However, I should have included low top/hiking shoe, because it is possible that hikers with these types marked “hiking boot” or “trail runners.” Oops again. CONGRATULATIONS to all hikers in our survey for their incredible achievements! Thank you so much for taking the time to help future hikers with their gear choices. Again, thank you to Zach Davis for his input on the survey content, for recruiting people to take it, and for his attempts to convince me that being a nerd is cool. Last year, we looked at hikers’ footwear, sleeping bags and pads, and shelter systems. So far this year, I have written about hikers’ backpack choices. In the next few weeks, I will also be writing about sleeping bags, pads, and shelter systems on the AT. Because the ATC does not report on demographics of section hikers, it is unclear whether more women section hike than thru-hike the AT. However, gender was not significantly associated with distance hiked. This was determined by conducting a binary logistic regression with Age and Gender entered as predictors of thru-hiking or not thru-hiking. The model was significant at p = .005. Age significantly predicted thru-hiking (p = .002, Odds Ratio = .684), but Gender was not a significant predictor of distance hiked (p = .633, Odds Ratio = 1.189). A binary logistic regression was conducted predicting shoe replacement (either same or different model) vs. no shoe replacement. Age and Gender were entered in Block 1. Distance hiked, initial shoe type/support level, and initial satisfaction were entered in Block 2. Models 0 and 1 were not significant. Model 2 was significant (p < .001), with distance hiked (p = .001, Odds Ratio = 1.866) and initial satisfaction (p = .046, Odds Ratio = .664) predicting shoe replacement. A binary logistic regression was conducted predicting switching footwear type (1) vs. wearing one pair the whole time/all replacements were the same type (0). Age and Gender were entered in Block 1; Distance Hiked, Initial Shoe Type/Support Level, and Backpack Capacity were entered in Block 2; Initial Satisfaction was entered in Block 3. The final model was significant at p < .001. Significant predictors were age (p = .011, Odds Ratio = .589, B = -.530), Initial Shoe Type/Support Level (p = .001, Odds Ratio = 3.193, B = 1.161), and Initial Satisfaction (p < .001, Odds Ratio = .311, B = -1.167). Due to the small sample of Cascadia 10 wearers I was unable to test this quantitatively, but considering that EVERY ONE of them said the 10’s were unsatisfactory and were replaced because they fell apart sooner than expected, I consider this qualitative information worth mentioning. I was once a passionate believer in Brooks Cascadias but that has changed with the 9s and 10s. Apparently Brooks got what they wanted, because for years now they’ve had an anti-thru hiking stance on the Cascadias and even go as far as to recommend that we use boots instead… which, despite being bad advice, I find sort of condescending. Mariposa, that was a very thorough and well-analyzed discussion. I appreciate how much detail and statistical effort went into it. Nicely done! It was helpful to me, and I am sure, many others. As an aside, I have often heard the Pennsylvania section of the trail referred to as “the Land where boots go to die.” Was there any indication in your analyses that the Pa. section was any more responsible for the untimely death of hikers’ boots than any other section of The Trail, or whether that assertion is more legend than fact? Thank you! That is a great question. Unfortunately, for the second year in a row, I forgot to include a question asking what direction thru-hikers were walking, which really limited some of the information I could glean from the analyses. It is unclear when hikers reached Pennsylvania. A few mentioned in the open-ended question that they replaced or switched out their shoes post-Pennsylvania, but not enough for me to know whether PA significantly impacted footwear choices. I have always worn hiking boots with a medium weight wool sock but want to try trail runners. Is there a consensus on what sock to wear with these? Material, weight, etc? Several thru hikers have told me that “Darn tough” wool socks are their preference. Specifically they said the other brands including smartwool etc tend to wear holes every 600-1000 miles. The Darn toughs will supposedly last the whole trail. From personal experience I’d rank Darn tough>Thorlo>smartwool>wigwam. Wigwams were terrible to break in (fell apart and caused blisters) they did okay after that though. The AT is like the manicured greenway of trails. The motivations for wearing hiking boots really come into play on side trials or rougher terrain. If you run this survey again though, I’d also be interested to see satisfaction levels for non-gortex boots vs gortex boots. In future surveys I’d be curious to ask about size: did hikers need to size up as they replaced footwear? I agree with Katherine. I am curious about how many hikers needed to size up, and when this occurred. Also how it related to age. I would be specifically interested in what type of footwear lasted the entire thru hike, as there is a cost element to purchasing shoes/boots once for the entire hike versus replacing more than one time. My daughter is currently on the AT and just wore thru her 2nd pair of Brook’s Cascadia 10’s – The first pair got decent mileage, the 2nd pair (EMS clearance) made it only a few weeks. Granted she was in PA with lots of rock but thought they’d hold up better. She’s reported that her toe has poked thru. Brooks sent a new pair of 11’s and those are on the way to her. Should be interesting to see how those hold up – might need to switch brands to get her the rest of the way to Maine! Thank you for your wonderful data analysis. I’m still in the planning stages for my AT attempt. I see you are attending my arch rival, Old Miss. Archie Manning was at Old Miss when I was attending Mississippi State. I hated seeing him beat us, but eventually became a big fan of him and his sons. Good family.